The Most Rev. Robert E. Mulvee, former Catholic bishop of Providence, died Friday at age 88 after a brief illness, as reported by the Diocese of Providence. He died at the St. Antoine Residence, an assisted-living community in North Smithfield. Bishop Emeritus of Providence. The Most Reverend Robert E. Mulvee was born February 15, 1930 in Boston, the son of the late John F. and Jennie T. Mulvee. He prepared for the priesthood at Saint Thomas Seminary in Bloomfield, Connecticut; Saint Paul Seminary at the University of Ottawa, Canada; and the American College at the University of Louvain in Belgium. He was ordained for the Diocese of Manchester, New Hampshire on June 30, 1957 at Louvain. He served at a number of parishes in New Hampshire for several years before returning to Europe to do graduate work. In 1964 he completed his doctorate in Canon Law at the Pontifical Lateran University in Rome and also received a master’s degree in religious education from the University of Louvain. Later that year, he was named assistant chancellor of the New Hampshire Diocese and began a career in which he held numerous diocesan and parish positions. Pope Paul VI named him a Papal Chamberlain with the title of Monsignor, in 1966. In 1977, he was named the first Auxiliary Bishop of Manchester. In 1985, Bishop Mulvee was appointed the seventh Bishop of Wilmington, Delaware. Bishop Mulvee’s tenure in Providence began in 1995 when he was named Coadjutor Bishop of Providence. He became the seventh Bishop of Providence on June 11, 1997. Since 1997, Bishop Mulvee has served on many national and regional boards and committees. February 15th, 2005, upon the occasion of his 75th birthday, Bishop Mulvee requested retirement from the Office of Bishop of Providence. 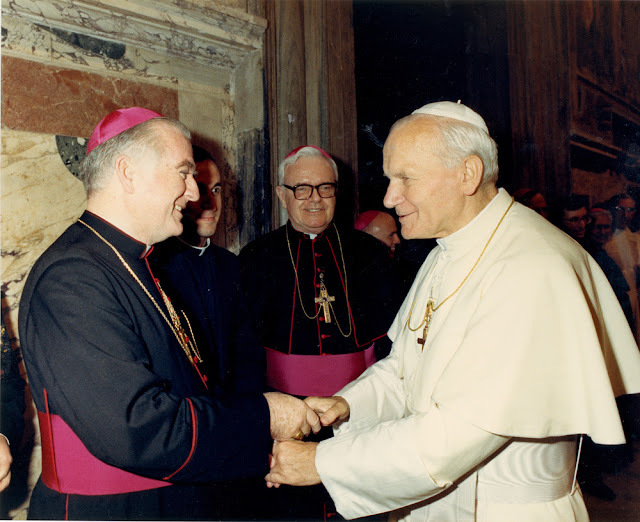 Pope John Paul II accepted his retirement March 31st, 2005, and designated Bishop Thomas J. Tobin, then-Bishop of Youngstown, OH, to be installed as the 8th Bishop of Providence. Bishop Mulvee became Bishop Emeritus of Providence on May 31, 2005. He continues to be involved in ministry in the Diocese of Providence. On May 18, 2017 Bishop Mulvee receives a Lumen Gentium Award for Administration and Stewardship - more here. June 2017 Bishop Mulvee marked his 60th anniversary as a priest, 40th as a bishop.